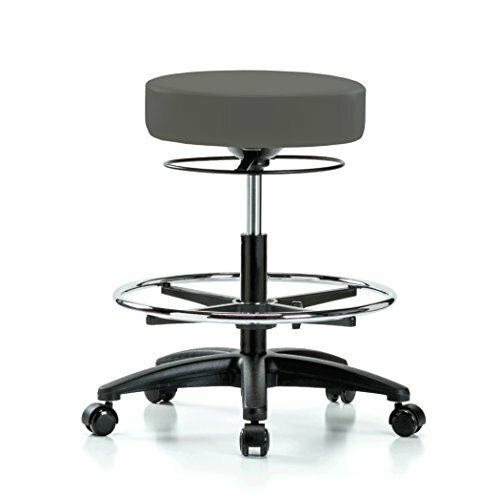 Our Perch STELLA ROLLING MEDICAL STOOL features a 360-degree "All-Around" pneumatic height adjustment ring that allows you to quickly adjust the height from anywhere you reach under the seat, a 17' vinyl seat with 3" of foam padding available in 12 different colors, a durable 5 leg 24" diameter fiberglass reinforced nylon base strong enough to handle up to 300 lbs of daily usage, and 3 castors to choose from: Soft Floor Casters are best for soft floors carpet, linoleum, or rugs; Hard Floor Casters are best for hard floors wood, tile, or ceramic; Glides/Stationary Caps are like little feet that make the stool stationary. We offer a 12 year warranty with a lifetime warrantly on cylinders. Perfect for medical or dental offices, labs, salons, massage or tattoo practices. SIT SMART - WORK SMART! The STELLA MEDICAL STOOL isn't just a stool, it's a tool! It's ergonomic design, world class components, and quality construction help you to work, learn, and play more effectively. 12 YEAR WARRANTY - Lifetime on Cylinders! FAST & FREE shipping and returns! CUSTOMIZE 36 different color and caster combinations! Choose your casters according to the type of floor you have: Soft Floor Casters for carpet and linoleum; Hard Floor Casters are best for wood, tile, or ceramic floors; or if you don't want it to roll choose Stationary Caps - they'll keep your chair in place. BUILT TO LAST Designed to be used all day - every day! The seat on this work shop stool is 17" in diameter and has a 3" inch layer of foam padding. It's durable 5 leg 24" diameter fiberglass reinforced nylon base will hold up to 300 lbs. of weight on a daily basis. If you have any questions about this product by Perch Chairs & Stools, contact us by completing and submitting the form below. If you are looking for a specif part number, please include it with your message.